A dozen years had passed since Pauling's first, failed attempt to solve the keratin structure. Now, in 1948, he was ready to try again. 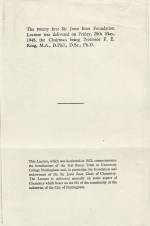 The intervening decade-plus of protein work (Pauling's portion of which was conducted around his wartime research, continued work on other molecular structures, the writing of a textbook, the search for grants, and the duties of chairman of the chemistry division) was beginning to yield important insights into the relationship between protein structure and function. On the practical side, Corey's work with amino acids was providing more precise information on sizes and bond angles of protein's subunits. From a theoretical standpoint, Pauling remained focused on the lessons he had learned from antibody research: Proteins recognized and bound to each other through precise complementary shapes. He now saw this basic idea of molecular complementarity working in other biological systems. He included enzymes, for instance, biomolecules that acted as catalysts by speeding reactions in the body without themselves being changed. Enzymes were necessary for life itself. But how did they work? Here again there was great specificity involved in the reaction, with each enzyme highly targeted in its action, binding to a single starting molecule (called a substrate) and transforming it into a new molecule (product). Pauling thought that complementarity was responsible. In his view, the protein enzyme would have a shape that loosely fit a molecule of substrate. This fit would tighten, grow more precise, if the substrate was twisted or bent a bit into a form called an activated complex. This strain would make it more likely that the starting substance might participate in a chemical reaction to form the product. The product, once formed, would again be only loosely held to the enzyme, ready to let go and free space for another reaction. Enzymes, according to this theory, acted like molecular pliers, bending the substrate and making it easier to break into pieces that could be reformed into new products. Pauling's ideas about enzymes were proven to be essentially correct. But there was more to come. The senses of taste and smell, Pauling thought, might operate through a complementary fit between sensed molecule and specific binding sites in the body (a theory still in favor among odor researchers). New drugs might be devised that would act by mimicking the complementary structure of natural substances. Complementarity, he thought, might help explain how viruses worked. Then there was the biggest question in biology: how genes operated. As Pauling and Delbrück had hinted in 1940, complementarity might also play a part in the replication of genes. In a number of lectures and presentations Pauling gave on complementarity in 1948, he fleshed out the idea: "In general the use of a gene or virus as a template would lead to the formation of a molecule not with an identical structure, but with a complementary structure. It might happen, of course, that a molecule could be at the same time identical with and complementary to the template upon which it is molded," he said. "If the structure that serves as a template (the gene or virus molecule) consists of, say, two parts, which are themselves complementary in structure, then each of these parts can serve as the mold for the production of a replica of the other part, and the complex of two complementary parts thus can serve as the mold for the production of duplicates of itself." This was a description of the basic duplex nature of the double helix – four years before it was discovered. See Also: Linus Pauling note to self concerning taste and molecular shape. July 9, 1951. See Also: "The Future of Enzyme Research." November 1, 1955. See Also: "The Gerontology of Viruses." 1950s. See Also: "Molecular Complementariness and Biological Specificity" and "The Structure of Proteins." February 26 - 28, 1968. See Also: "Molecular Complementariness and Serological Specificity." October 31, 1974. 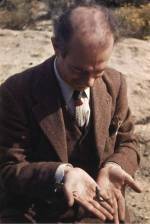 Linus Pauling examining a small lizard. 1948. "Molecular Architecture and the Processes of Life." May 28, 1948.